Available to rent, lease or buy. Offers a huge range of snack products. With a very high capacity, the Snack Break can be configured to your requirements to vend crisps, chocolate bars, bottled drinks and cans. All products are refrigerated to ensure freshness. 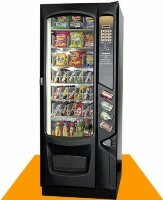 The Snack Break can be used as a stand alone unit fitted with coin control, or a slave unit alongside one of the Darenth range of drinks machines. 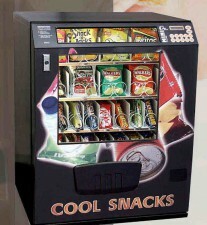 The Snack Break is fully compatible with changegiving coin mechanisms and with the I-Key cashless payment system. Designed to be used with one of the Darenth drinks machines this new unit offers a choice of snacks, confectionary and ice cold cans. Can use the coin control of the drinks machine or can be fitted with it’s own coin mechanism. The Snack Break Mini can also be used as a stand alone unit if required. The SnackPoint range of food and snack vending machines is specially designed with temperature controlled cabinets to serve chilled drinks and cool snacks at a constant temperature, regardless of the ambient temperature.